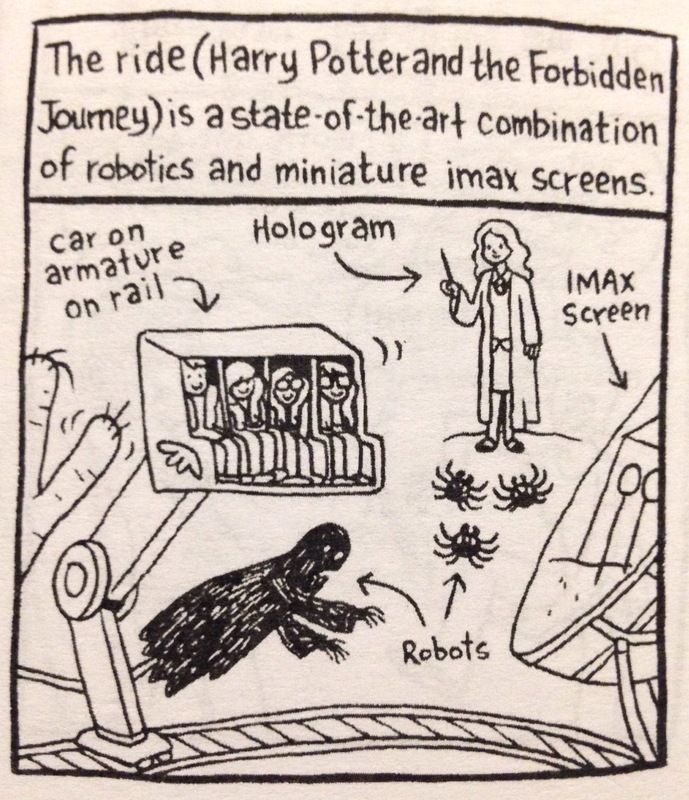 Summary: Lucy Knisley’s Here At Hogwarts is a travel log in comic form recording the trip the author took with her flatmate to the Wizarding World of Harry Potter at Universal, Orlando. Recently a friend, and fellow librarian, shoved a small booklet at me and instructed me to read it. “It’s a graphic novel travel log,” she said. Knowing how I like to travel log, she said I needed to read it. I haven’t read many graphic novels. To me, books mean lots of pages, that book smell, and descriptions that paint a picture you can almost see. Confession: I might be a bit of a book snob. I was skeptical. 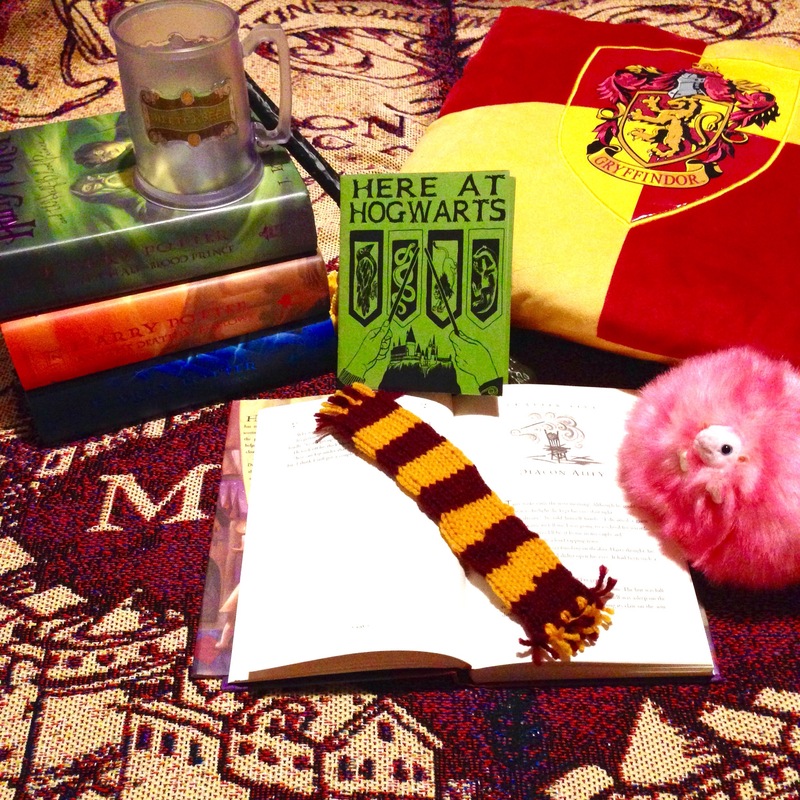 “It’s about Harry Potter Wizarding World, Orlando,” she said. I was sold. She knows my weakness for anything Potter related. I read the whole thing that night and was amazed. 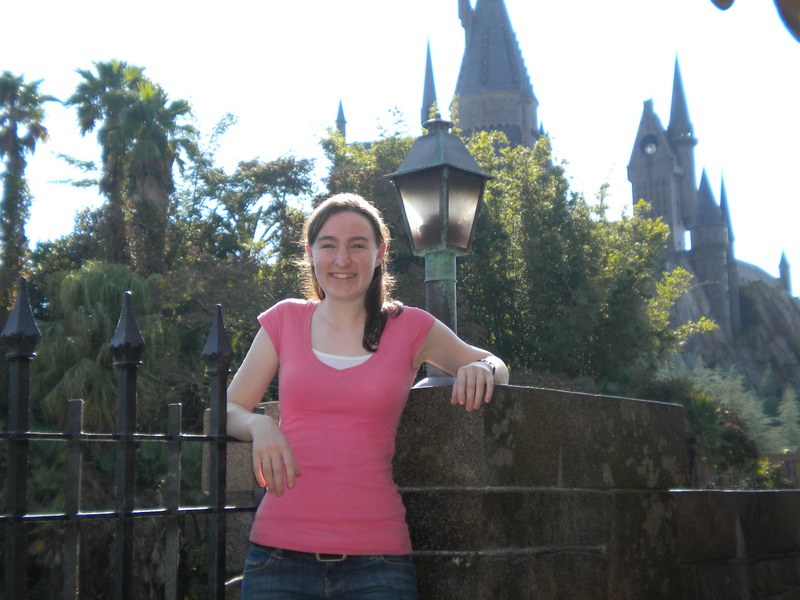 Having been to the Wizarding World myself a few years back I was able to relate and compare my own trip. Similarly, I went with girls who lived with me in my grad-school dormitory. 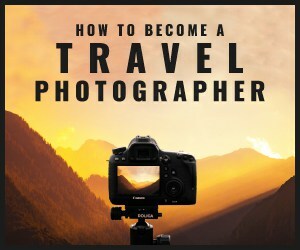 My friends and I took dozens and dozens of photographs and had I been travel logging at the time, I probably could have written pages and pages describing our experience. Knisley’s travel log is only 28 small pages and mostly drawings, and yet I felt her booklet said just as much or more about the park using comic speech bubbles than I could have in several paragraphs! 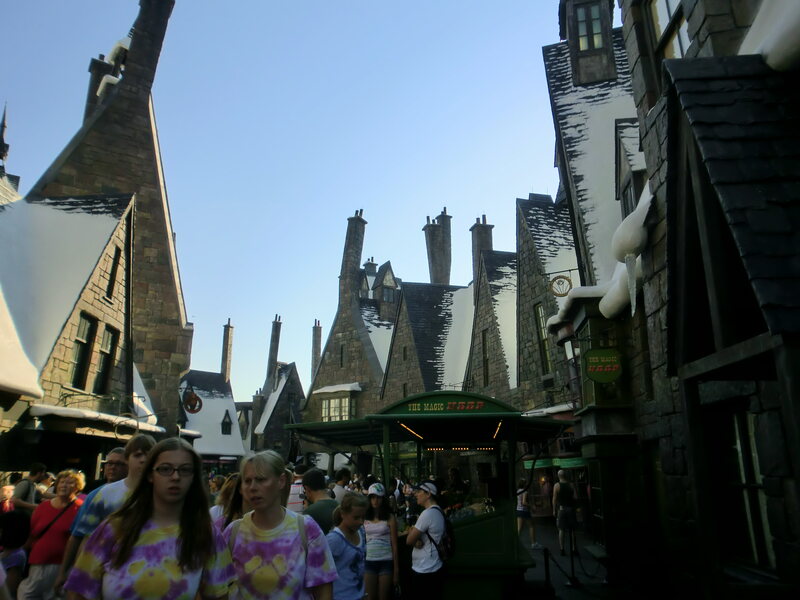 Visiting the Wizarding World of Harry Potter, Orland, Florida. The Hogwarts Castle is behind me. Knisley’s sketches appeared comprehensive, including much of the detail I remembered from my own trip. 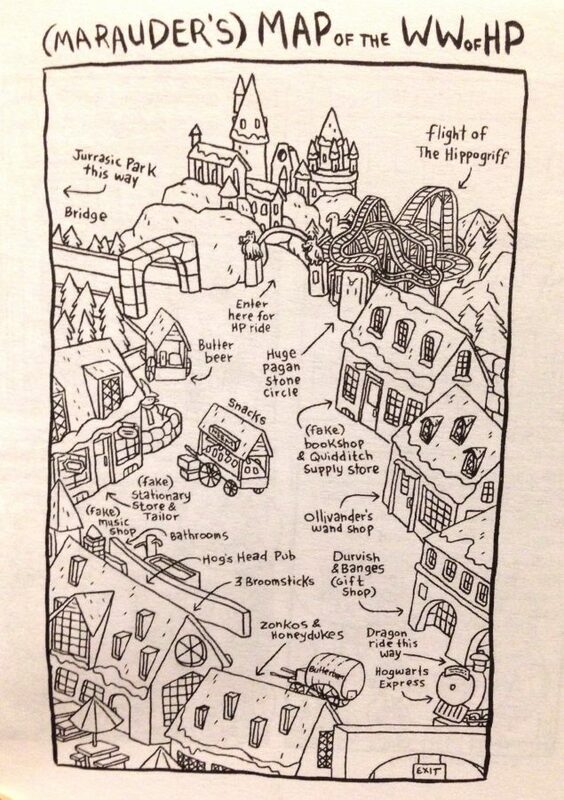 Where I would have spent time describing the small street and shops of the so-called “Hogsmeade” that culminates in the Hogwarts Castle, all Knisley needed to convey the same was a sketched map of the area. 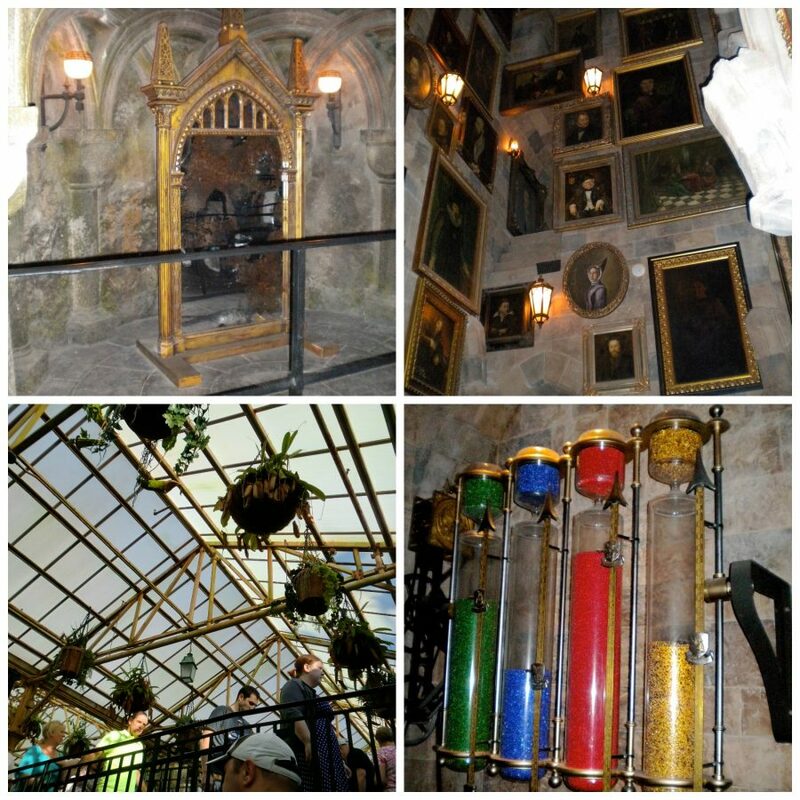 While waiting in line inside the Hogwarts Castle for the ride, you pass through replica Hogwarts Castle rooms and by replica film artifacts. Knisley uses one cartoon box to my like 12 photographs. Knisley’s travel log also captured visually some of the things my travel log could only explain in text. When it comes to the ride, all cameras must be put away. (Actually, if you’re smart, unlike me, you leave anything that can fall off of you in the locker before the ride. You’ll want your hands for holding on!). While it is difficult to explain that the ride is not a front-facing roller coaster car, but a sideways contraption, it is much easier to understand Knisley’s graphic drawing of the ride. There are benefits to being artistically inclined. I enjoyed Knisley’s logging style. She not only visually shows her adventure, but she describes conversations she had with park employees, and also records the parts of her trip not pertaining to the park. She is often introspective. (Perhaps that comes along with the territory of thought bubbles?) 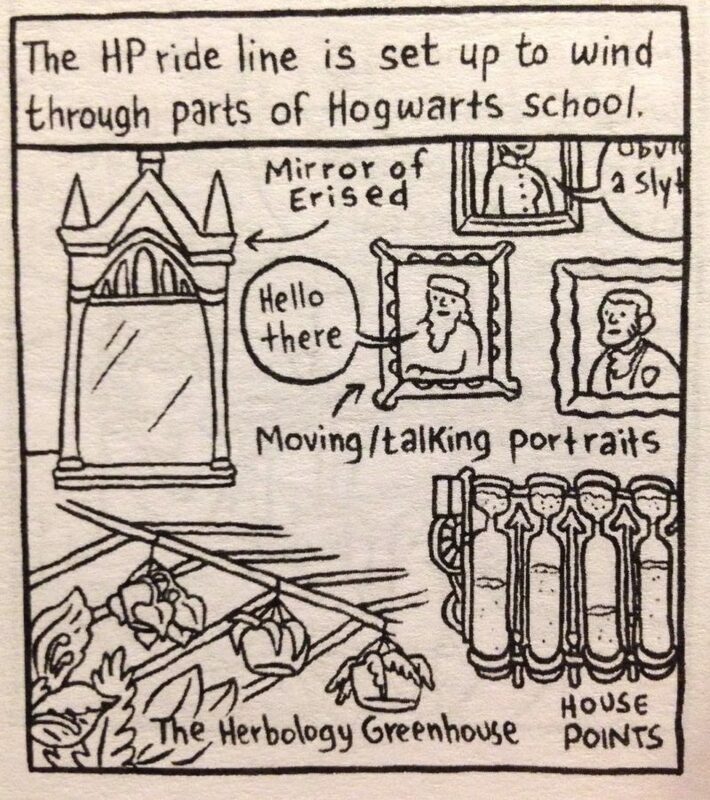 Unlike a comic book, she is not exactly funny, but does not shy away from mentioning the irony of finding herself in a place inspired originally by books, and not being able to buy any of the Harry Potter books. 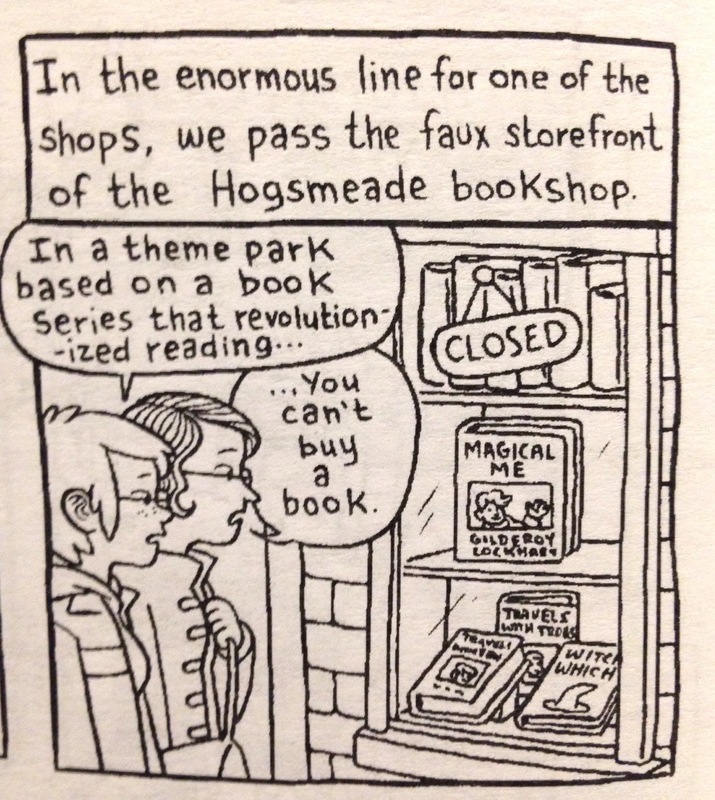 In fact, one of the few fake storefronts that you cannot enter happens to be a bookshop. This little booklet is a quick read, entertaining. I was fascinated by this different form of travel logging and I couldn’t wait to get my hands on another of Knisley’s graphic novel travel logs! 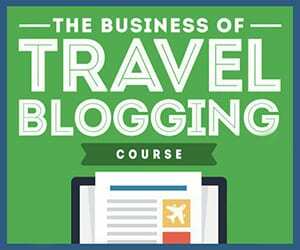 How do you travel log? Tell me about it in the comments below! Previous Post Author Talk: Sharon Kay Penman Gave Me A Cupcake!